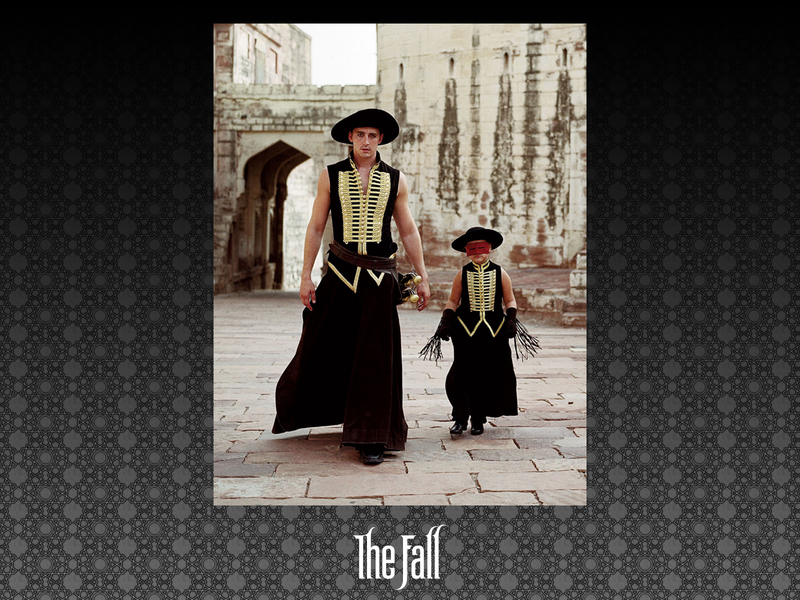 The Fall is one of the most visually stunning movies I’ve ever seen. I’m not usually one to notice or care about such things, but the backdrops and settings are just absolutely amazing. Experiencing them is reason enough to watch the film. The lush atmosphere is, at times, forced to compensate for the script (penned by Dan Gilroy, Nico Soultanakis, and director Tarsem, based on an older screenplay by Valeri Petrov). Which is unfortunate, because the story had the potential to be something really special. Taking place in the 20s, Lee Pace, a Hollywood stuntman, is in the hospital for love-related reasons, and has a pretty major case of depression. Also in the hospital is a little girl with demons of her own. He starts telling her a fantastical story of a band of almost superhero types and their quest to destroy an evil ruler. I appreciated the dark side of the film, as Pace’s depression worsened, so did the plight of the characters in his story. I also thought the film did a good job balancing the story with the events of the present. The script has a sense of humor I enjoyed, though I wish it was allowed to come out a little more often. And I’ve probably raved about Pace enough, but here’s hoping he continues to get roles like these. The little girl, though, I found to be near-unintelligible at times. The story was interesting, but it felt like it was lacking a certain continuity which therefore diminished how satisfying it was. Each storyline’s resolution felt a little weak, which may have been a combination of relatively weak endings and inadequate buildups. Lee Pace’s “present day” one, for example, probably could have stood to have a few blanks filled in a little better. There’s also one scene that describing would spoil, but though bold, it does end up feeling pretty out of place, I thought. Matthew Broderick plays a bad sitcom writer (working on a bad sitcom, not really a bad writer, we are led to believe) with a gambling problem. (You know, why is it always a gambling problem? Why can’t it be a gambling solution?!) He loves to play the ponies, but alas, it is the ponies who end up playing him. Even after he gives his wife complete control of their money, and goes to a gambling shrink, his wife catches him continuing to gamble. By finding betting slips in the car. Desperate for a final chance to redeem himself, it happens that they find out his wife’s niece (Brittany Snow) is working as a prostitute in Vegas, and his wife promised to pay for her stint in rehab, only the girl doesn’t really want to leave. So he volunteers to go to Sin City and bring her to rehab, without gambling once. A promise he breaks roughly fifteen seconds after reaching Vegas. It also turns out that Snow likes her life just fine, thank you very much, and has built a nice little home for herself, complete with a leech of a boyfriend. Anyway, they each learn something from the other, a relationship or two falls apart, there’s a pimp who wants to be a TV writer, and they make it out to the rehab center. Yay. Like a bad sitcom, Finding Amanda tries to be cheesily funny and teach “life lessons” in a world with seemingly limitless second chances and where actions have little to no consequences. And like a bad sitcom, Peter Tolan’s script is rarely funny (with telegraphed jokes) and the drama tends to fall flat. Matthew Broderick is pretty much exactly how you’d expect to be, and I kinda like Brittany Snow, so I thought she was pretty good. Exemplifying the problems with the movie, Steve Coogan plays a supporting role as a casino manager, but he isn’t really allowed to be funny, he’s just sort of there. The story was fairly interesting, though, and I think there’s probably something to be done with the idea of a guy stuck writing for a bad sitcom (the highlight of the movie is the short scene of the show we see, starring Ed Begley, Jr.) and struggling demons, only to be forced to visit their epicenter. But making a dark comedy can be precarious, and Finding Amanda ultimately loses its balance. You stole two hours of my life! In the interest of full disclosure, I watched Thief with my family on Yom Kippur, so I may not have been in the most ideal movie-watching condition. Thief is pretty much exactly what I’m beginning to expect from a Michael Mann movie: a fun main character/actor, an interesting and seamy subject turned into something rather boring, a runtime about 45 minutes too long, and me being left with no desire to see any more Michael Mann movies. Even thinking about the movie bores me. A good bellwether proved to be the film’s opening scene, which may be the longest and most boring heist scene ever filmed. I suppose the movie has a plot, technically, but Michael Mann clearly doesn’t care about such things. “Don’t worry your pretty little head about the story,” he says. “Look at all my style.” Emphasis his, since I’m sure Michael Mann speaks in italics. James Caan stars as a no-nonsense safecracker who gets hired for a big job, one he intends to be his last before going straight. And that’s about it. Along the way, he picks up a waitress (Tuesday Weld) and I guess they love each other or something, but Mann doesn’t bother with developing their story any more than he grabs her, pushes her around some, reveals his sensitive side, and then they move in together. To be fair, at the very end of the movie there’s a little action, but by then, any sane person has fallen asleep or turned the movie off. On paper, the movie sounds like a great idea. James Caan is obviously a badass, so he totally works as an ex-con master thief. Tuesday Weld is incredibly beautiful (see: The Cincinnati Kid or Dobie Gillis. Also, her name is Tuesday. That’s ridiculous.). Dennis Farina (in his first role, according to imdb) and Robert Prosky as baddies. And, best of all, Willie Nelson as Caan’s best friend, who is still in the joint. You know, maybe James Belushi should have tipped me off. But my word does the movie manage to be dull. Except for a few seemingly random instances where something major happens with little warning and little recognition afterward. Really, there’s no good reason to watch this movie. Unless, like my family, you need a nap. Doggies don't like having their teeth brushed. I saw Ghost Town with my grandma, and I’d say that’s about right. Certainly felt like a movie I could see with her, where we both would enjoy ourselves. As an aside, I generally don’t like movie audiences. People seem to laugh too long, or at the wrong times. I don’t understand the need to take a phone call during a movie. And I never quite got the desire to talk out loud during a movie. Just let me watch in peace. That said, I absolutely love that my grandma provides a running commentary of her feelings for the whole theater to enjoy, and I hope she never changes. The movie is fairly standard stuff. Ricky Gervais plays a typical world-hating grump who gains the ability to communicate with dead people still hanging around because there’s something in this world they need to complete. Gervais just wants to ignore them all, and it becomes apparent to him the best way is to help the recently-deceased Greg Kinnear, who wants to prevent his wife (Tea Leoni), an archeologist who happens to live in the same building as Gervais, from marrying someone new. You may be able to predict most of the rest, but I have to hand it to screenwriters David Koepp and John Kamps, who crafted a consistently solid movie. Ghost Town moves along at a good pace and manages to crack funny jokes at fairly regular intervals. And no, I’m not just saying that because they managed to work in a Sting joke. Granted, part of its success surely relies on Ricky Gervais, but I felt the script likely guided him to be accessible to my grandma in a way he might not otherwise have been. A few fun people show up in supporting roles. Aasif Mandvi, who is on the Daily Show (and also was on an episode of Ed, apparently), is pretty good as the sole source of reason in the film. And Kristen Wiig has a small part as a surgeon. I may not find her as attractive as some people I know, but I’ve somehow seen her in a bajillion movies already, aside from SNL, and I’ll wholeheartedly join in with the chorus rooting her on to graduate to bigger and better things. Oh, and for those who have seen it, I’ve been sneezing a lot today. Very strange indeed. In late October 2001, the U.S.A. was still hurting. It was a time of uncertainty where we knew we were living in a new world, just not what that meant, exactly. Some claim it was “The Rising” that allowed the country to finally a collective breath, but that wasn’t released until mid-2002. But actually, it was a little movie called On the Line that finally got the U.S.A. back on track. Surely you remember the romantic comedy. An ad man has a great conversation with a girl (the lovely Emmanuelle Chriqui) on the El (the Chicago metro, for the uninitiated). He wishes to pursue a relationship with said girl. Only trouble is, he doesn’t have her phone number. Or name. So, being a good ad man, he puts together an ad campaign (posters, billboards) across the city, trying to find her. Women across the city, naturally, find that incredibly romantic and besiege the guy with phone calls claiming to be the girl, so his friends kindly step in and handle going out with all the girls. Oh, right, it might jog your memory to learn the film is basically an *NSYNC vehicle, with Lance Bass in the lead, and Joey Fatone playing a good friend. Improbably, Dave Foley and Jerry Stiller also show up, and there are a whole slew of cameos. But actually, On the Line isn’t half bad for a romcom. The plot may not be particularly fresh or have surprising twists, but it keeps a pretty good pace. Bass is fairly likable as the standard plays by the rules, deserves a break leading man. Perhaps unsurprisingly, Fatone works as the somewhat annoying and abrasive best friend who wants to be a musician. And I’m a big fan of Chriqui, here playing a slightly more winsome version of her character in 100 Girls. I think she’s just starting to have the career she deserves. The more tertiary characters are perhaps a bit underutilized, particularly Dave Foley, but Jerry Stiller and Tamala Jones probably could have been given more to work with, as well. And, oh, the cameos. Bass and Chriqui first bond over Al Green, so he shows up to sing, which is awesome. Richie Sambora plays Mick Silver, a famous rock star, not just hilarious because it is Richie Sambora showing up in an *NSYNC movie. There’s a brief baseball scene with Chip Caray, Sammy Sosa, Damon Buford, and Eric Young, among others. Baseball fans, like myself, will surely be delighted at that bunch. And in the credits, Justin Timberlake (and the other *NSYNC guy) shows up as a flamboyant make-up artist. Which is exactly as fantastic as it sounds. And the music, naturally, is not to be missed. Well, at least if Joey Fatone singing hair band music is something that intrigues you. Plus there’s some*NSYNC pop sprinkled in, of course. Oh, and the film was scored by Stewart Copeland. The key phrase for On The Line is “managing expectations,” I think. It delivers pretty much exactly what it promises, especially if you watch the trailer. It is a standard romantic comedy with streaks of ridiculousness expected from an *NSYNC vehicle. If you can have fun with that, you’ll enjoy the film, otherwise stay away. Also, (and please keep in mind I’m in no way suggesting any sort of comparison between the two films) when I saw Slumdog Millionaire, there were two scenes that, to me, were fairly reminiscent of this movie. For whatever that’s worth. Trailer after the jump, and it appears you can watch the whole movie on YouTube, if you are so inclined. Is it a coincidence I wrote this post on Halloween? For reasons not entirely clear, my brothers and I watched The Dentist 2 late one night at my grandma’s, a few years back. And so, obviously, I was curious to see if the first one was as ridiculous as its sequel. The Dentist stars Corbin Bernsen (not Benson, or am I the only one who finds his last name confusing) as, well, a dentist. A slighly mentally disturbed one who cherishes cleanliness. After catching his wife cheating on him (on their anniversary! With the pool boy!) he sorta snaps, and soon finds a reason why just about everyone needs to be cleaned – meaning mutilated in various ways guaranteed to get you to think twice about going to the dentist. I thought the scenes where Bernsen destroyed people’s teeth were brilliantly shot, and I definitely cringed each time I saw a tooth being ground down to a bloody pulp. Bernsen’s character, while not necessarily bringing anything new to the canon, was actually pretty interesting (helped, no doubt by the actor), and definitely worthy of being the center of two movies. But, ultimately, the movie is a mess, as hokiness abounds, and the film often feels like the writers (Dennis Paoli, Stuart Gordon, and Charles Finch) are a little too into bad 80s movies. The subplot with the cops who track down Bernsen seem like a begrudging afterthought, for example. Bernsen is legimately creepy character, but he’s rarely allowed to shine through, as the movie spends too much time getting the victims to the good dentist. And not enough time on their dental destruction, the other strength of the movie. Mark Ruffalo shows up a small role as a talent agent, which is amusing. And there’s Molly Hagan, who I immediately recognized from a Murder, She Wrote episode. Sometimes your proudest day can be your most shameful. Like most people, I enjoy being right, particularly when my brother isn’t. Unsurprisingly, I’m not particularly fond of those few, inconsequential times when he happens by sheer luck to be right about something and I happen to, well, not be. Here’s a rough approximation of our conversation. My brother happened to be right. This time.